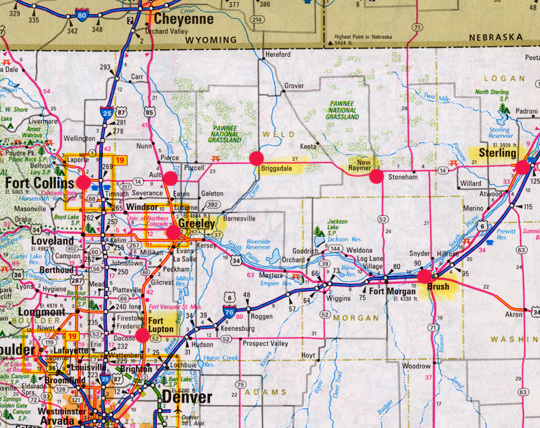 From Fort Collins to Briggsdale to Sterling, Colorado, the red dots on the map include some of the ranching communities where animal mutilations were reported repeatedly in the 1970s and 1980s. October 17, 2009 Albuquerque, New Mexico - The following continues from Parts 1- 4 about the 1980 animal mutilation high strangeness summary I typed up for my private research files and am now sharing for the first time in this Real X-Files series. This segment follows up on Briggsdale science teacher, Iona Hoeppner's, investigation of the two steer mutilations on the Roland Ball ranch five miles west of Briggsdale discovered Tuesday, September 16, 1980. On Thursday, September 18, the Balls took Iona out to the pasture to take tissue and fluid samples from the freshest dead calf. A month later on October 15, 1980, I talked with Iona by phone about her investigation.